American superstar California Chrome is set to be given another chance at the Dubai World Cup this year at Meydan, where connections will be hoping he can go one better than the second-place finish in the race 12 months ago. The chestnut horse gained huge media coverage from all over the world when he won the first two legs of the Triple Crown in the United States. He was first successful in the Kentucky Derby at Churchill Downs and then, over the slightly longer trip of 1m2f, he was able to score in the Preakness Stakes at Pimlico. Sadly, California Chrome fell one short of the Triple Crown in the Belmont Stakes as he could only finish fourth at Belmont Park in the 1m4f race which was won by Tonalist. Since his Triple Crown campaign, the Art Sherman-trained horse has only won once, with success coming in the Grade One Hollywood Derby at Del Mar. But he did run a credible third in the 2014 Breeders’ Cup Classic in arguably in the most prestigious race in North America. In one of the closest finishes to the Classic in some years, there was just over a neck separating Bayern, Toast of New York and California Chrome as the judge called them home in that order at Santa Anita. Rather than take in a race in Dubai before his Dubai World Cup run, connections opted to give their horse a run out at Santa Anita in 2015. They then then travelled to the Middle East for the world’s richest horse race. 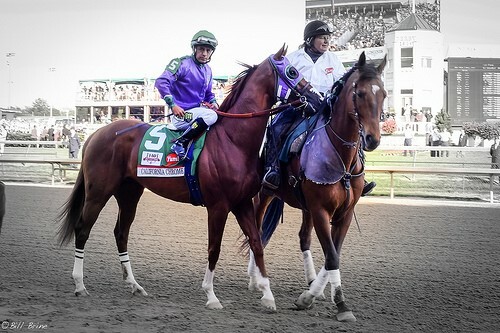 This time around, California Chrome is expected to run at least once during the Dubai World Cup Carnival. There is a meeting on every Thursday in the lead up to the final evening where the carnival comes to a close with the big race. As of late February 2016, California Chrome can be backed at 11-4 in the horse racing betting for the Dubai World Cup which is also set to feature Frosted, who has had plenty of success in America for trainer Kiaran McLaughlin. The horse runs in the colours of the Godolphin operation who would love to win this race in Dubai once again. Frosted has already had the advantage of running at Meydan in 2016. He recently won a Grade Two contest over 1m2f where he was successful by five lengths. That was his first start since October where he ran poorly in the Breeders’ Cup Classic which was won so emphatically by American Pharoah. The best Frosted could do at Keeneland was finish seventh of the eight runners as he faded near the end of the contest, with only Gleneagles behind him when crossing the line. The best of the British challengers for the 2016 Dubai World Cup looks to be come from the lightly raced Intilaaq for trainer Roger Varian. He has won on three of his five starts so far in his career. As a two year-old, he only ran once when finishing third on debut. The colt looked to improve the following season as he won on his last two starts, including the Group Three Rose of Lancaster Stakes at Haydock.